With the beautiful weather winding down for us in South Florida, we are taking full advantage of eating out here in our garden. Our pea gravel patio way out in the back that we actually named because I am a romantic through and through. The evenings are still cool enough to tolerate and perhaps it will be this way until Easter, that is only a couple of weeks away now. 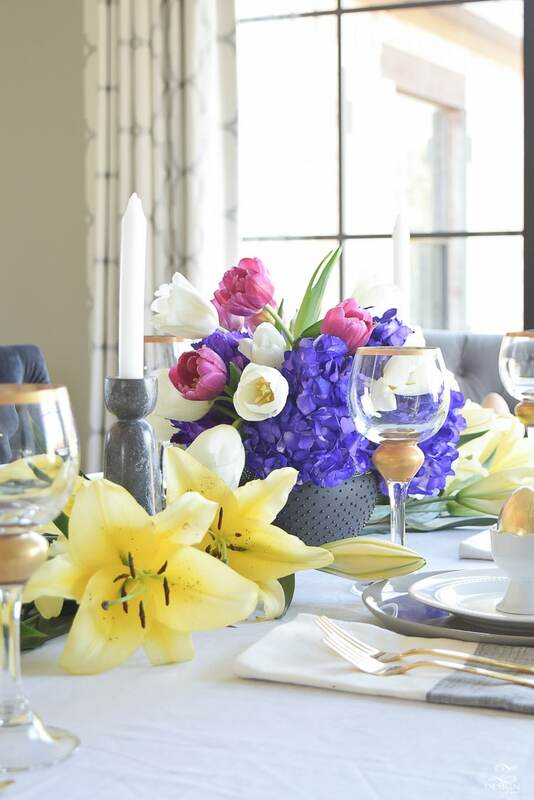 I’m hoping so and today I’m excited to be sharing spring entertaining ideas with a talented group of bloggers. If you are coming over from Julie Blanner and are new here…welcome and I hope that you visit the others on the tour! Thank you to our host Lory at Designthusiam for hosting. 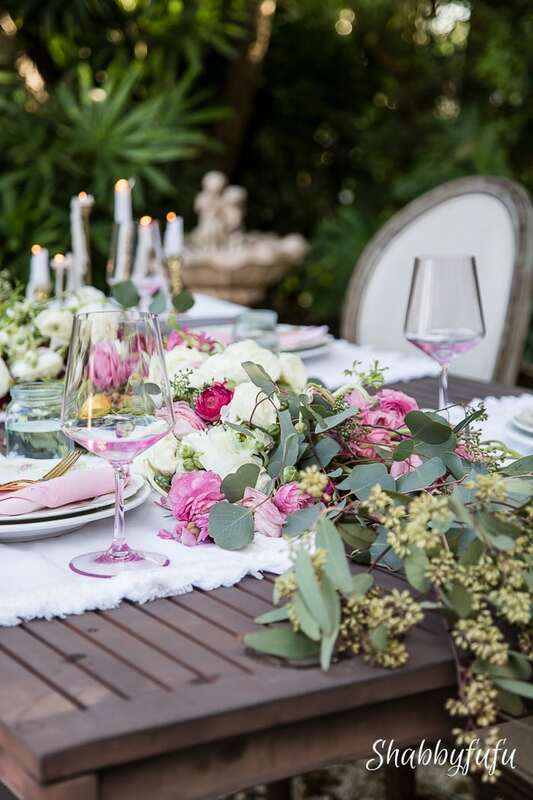 This tablescape and floral centerpiece probably look pretty complicated, but in all honesty it was so easy to do and the hardest part was bringing everything outside to the pea gravel patio at the back of our property. 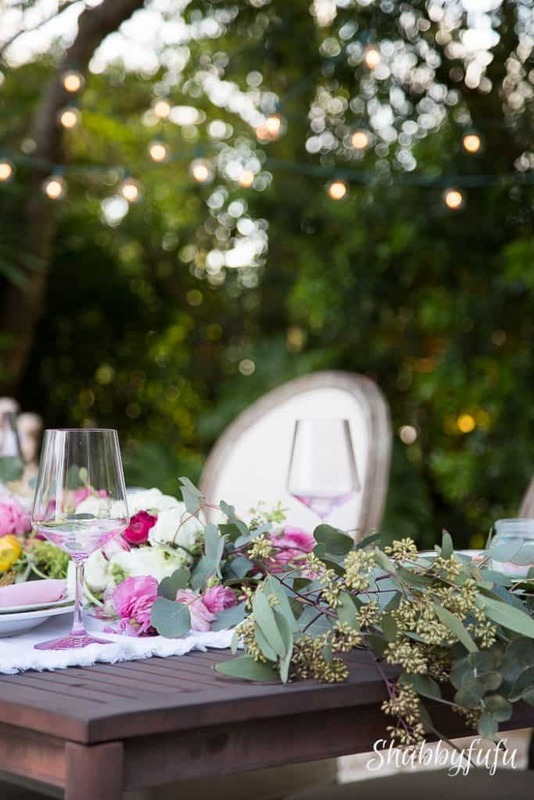 Let me explain how I quickly put this look together…just in case you like it and are looking for some ideas and tips for YOUR outdoor dining. I brought all of my flowers that were starting to drop petals and lose their shape out to the area in a couple of buckets. The ranunculus look pretty good in these photos, but they are delicate and the stems start to bend in just a couple of days after purchase. Our garden was scattered with petals that dropped on the way out here…which actually was a beautiful thing! 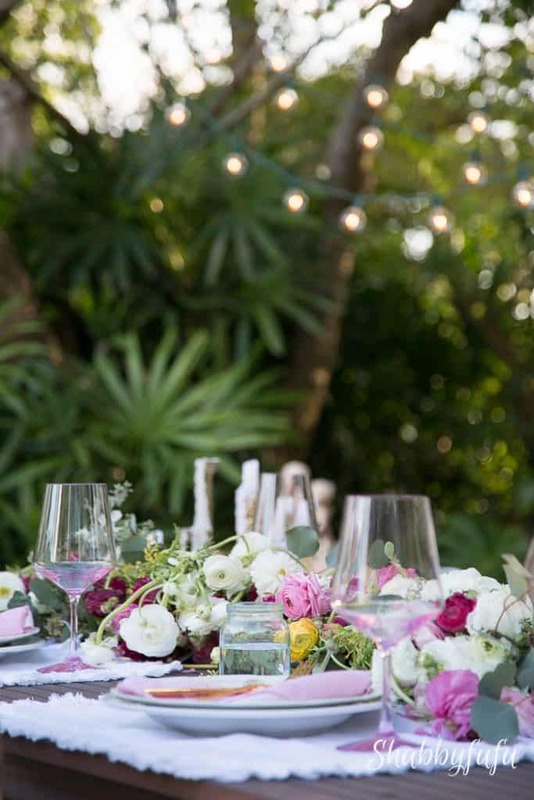 I draped the flowers across the center of the table and as I went along tucked in the long stems underneath the flower heads so that they didn’t show. That’s pretty much it…nothing complicated and very easy to do! The seeded eucalyptus was added in afterwards and I made sure to drape some down over both ends of the table. Why? 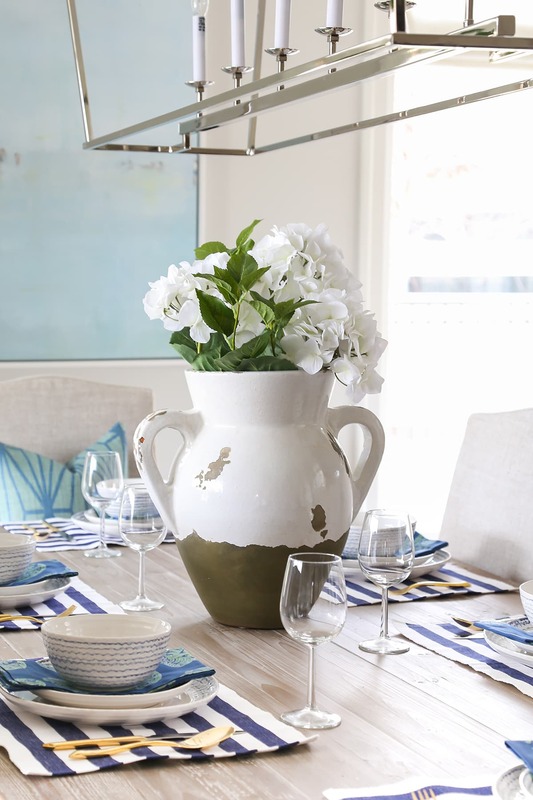 I feel that it gives movement as a table runner would do hanging over the table’s edge. 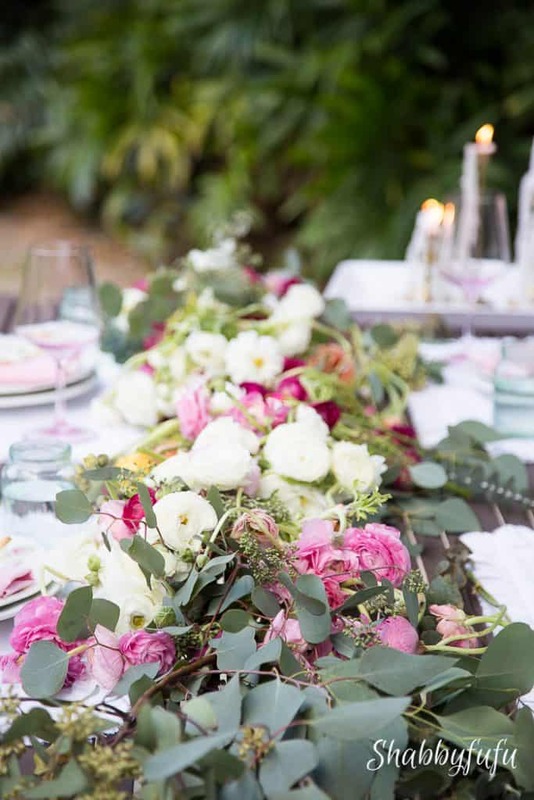 In creating a floral runner yourself, just be sure to blend and keep stepping back to view your results from all angles and keep it loose, flowing and with lots of movement of color. 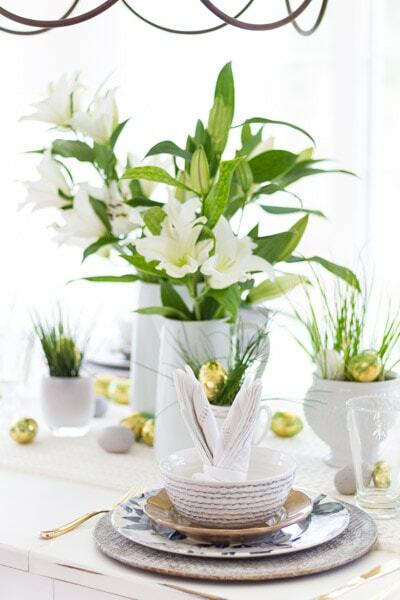 You can also do this with silk flowers and there are some amazing silks out there for sale at this time of year! 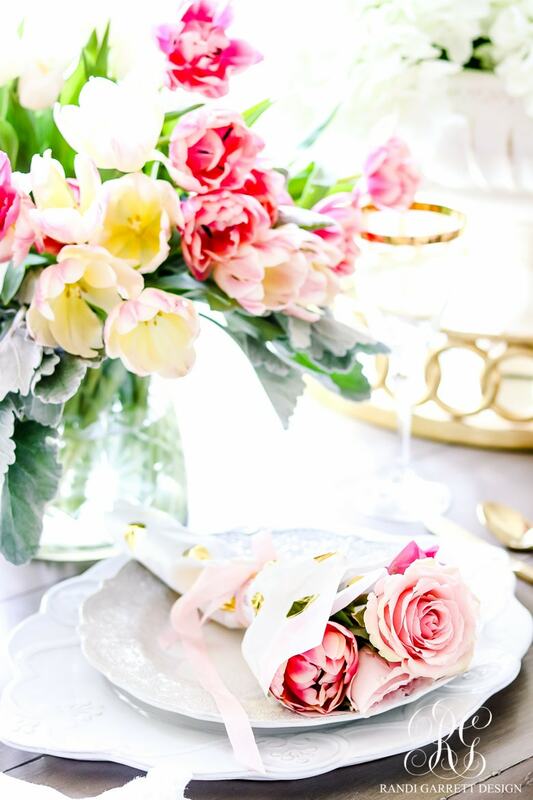 Simple white ruffled placemats were set out to lighten the look, and I stacked a vintage floral plate on top of my everyday dinnerware. 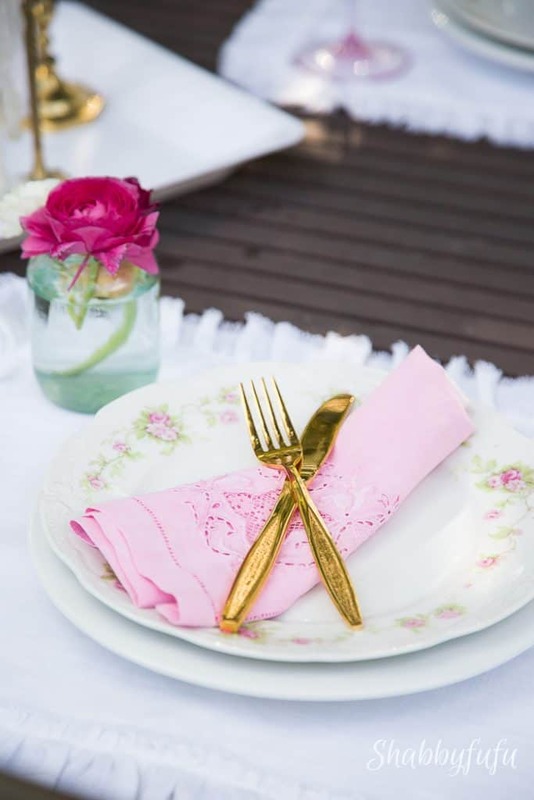 The blush pink napkins are vintage as well and I ombre dyed them as shown in this post. Vintage gold flatware and the look is done. See how easy that can be? 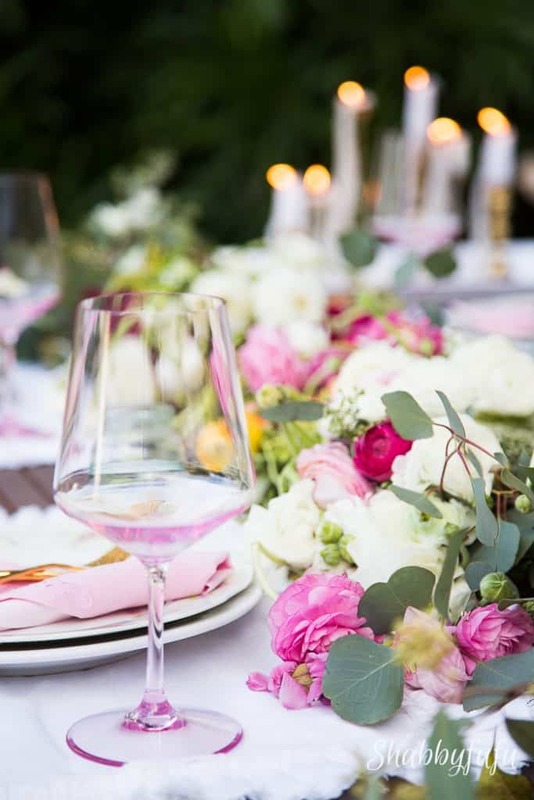 You might have noticed these pink wine glasses in several of my posts lately and I’m happy to report that they are plastic, so no chance of breakage out here! I found them in the clearance section of HomeGoods, so be sure not to overlook those shelves of your favorite store when out shopping for entertaining supplies or home products. 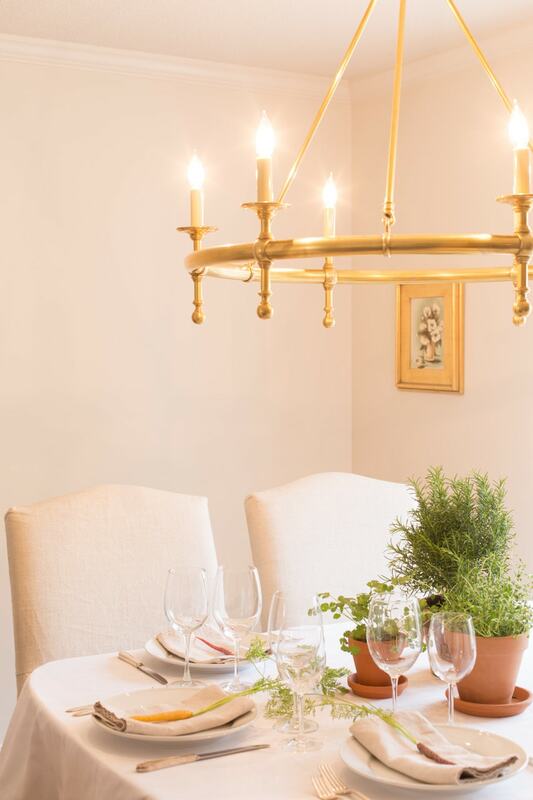 We sat out here and enjoyed dinner al fresco with the twinkle lights and part of my collection of vintage candlesticks in brass. 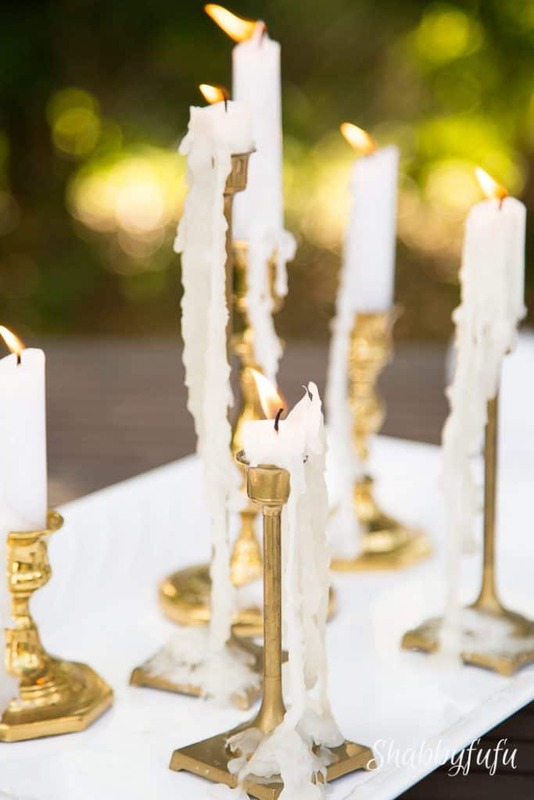 *TIP* I put my candles on a tray when outside to catch the drips that are inevitable with the breezes. 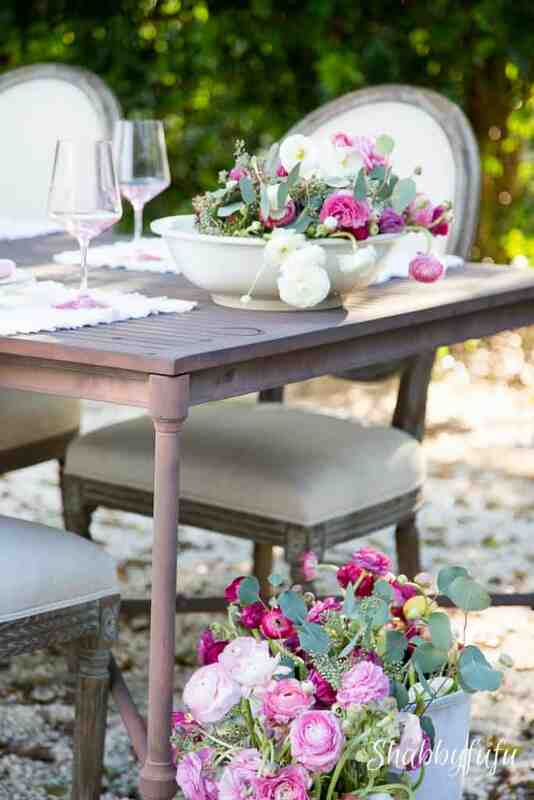 A lot easier than scraping wax off the table after a party or dinner outside! 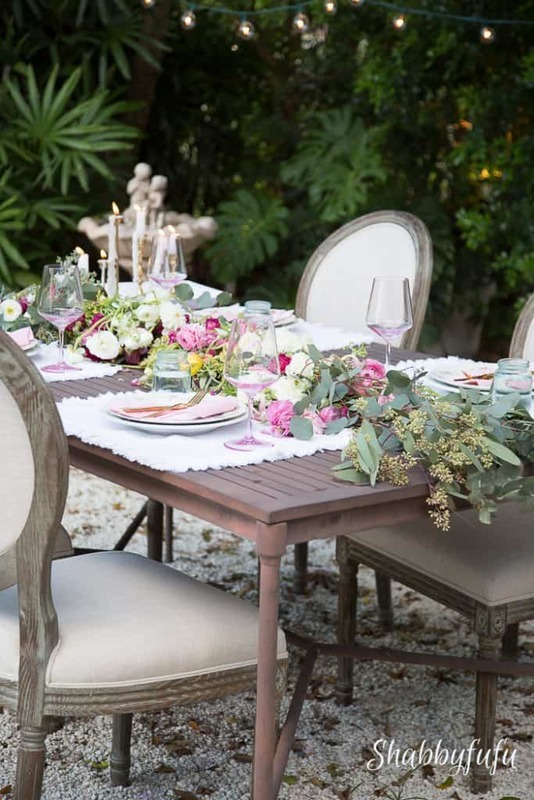 As long as weather permits eating outdoors bring the indoors out! I enjoy switching things up and brought these indoor dining chairs to the garden and the table that normally sits on the covered porch out into the open. 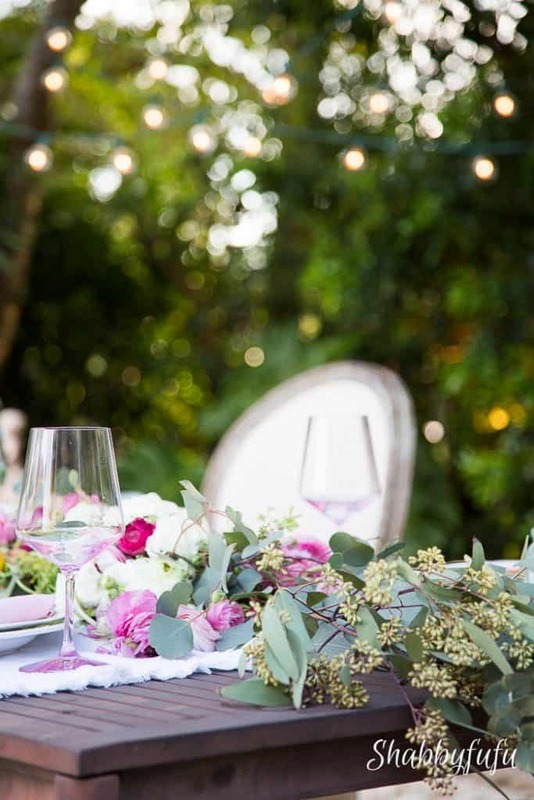 Most of you probably live where the weather will just start beckoning you to dine outdoors, so why not make it lovely? Happy dining friends!